World leader in testing for human safety in textiles. People spend about a third of their lives in bed. We take pride in our Natural Talalay Latex Mattress. We want to make sure that third of your life is not only comfortable but chemical free. If you don’t see the most current certificate you can click here if you would like to check with Oeko-Tex to verify that a certificate is current and valid. Because you spend 1/3 your life in bed, your bedding should be colorfast and perspiration-fast. It must demonstrate a skin-friendly pH-value. When it comes to bedding, such as pillows and blankets, covers and filling, it must pose no threat to health in order to guarantee a restful sleep. 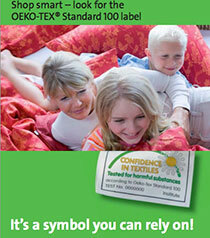 That’s why Oeko-Tex® always tests all product components thoroughly. Top-to-Bottom: Natural Talalay Latex Certified by Oeko_Tex. Head-to-Toe: Organic Cotton, pre washed for extra security.